Conveyors are used in many industries to transport materials horizontally, vertically, at an angle, or around curves. Types include non-powered and powered, live roller, slat, chain, screw, and pneumatic. Conveyors eliminate or reduce manual material handling tasks, but they present amputation hazards associated with mechanical motion. § Cleaning and maintaining a conveyor especially when it is still operating. § Reaching into an in-going nip point to remove debris or to free jammed material. § Allowing a cleaning cloth or an employee’s clothing to get caught in the conveyor and pull the worker’s fingers or hands into the conveyor. Other conveyor-related hazards include improperly guarded sprocket and chain drives. Overhead conveyors warrant special attention because most of the conveyor’s drive train is exposed. Employees have also been injured while stepping or walking on or near conveyors. 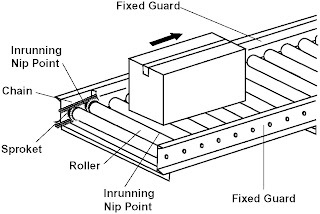 While removing a cleaning rag from the ingoing nip point between the conveyor belt and its tail pulley (non-powered end of the conveyor), an employee’s arm became caught in the pulley, which amputated his arm below the elbow. § Install guards for all sprockets, chains, rollers, belts, and other moving parts. Guarding by location — locating moving parts away from employees to prevent accidental contact with the hazard point — is one option for guarding conveyors. It is particularly difficult, however, to use this method when guarding the in-going nip points on certain conveyors such as roller conveyors because the exposed rollers are crucial to the function of the conveyor. § Use prominent warning signs or lights to alert workers to the conveyor operation when it is to install guarding devices because they interfere with the conveyor’s operation. § Ensure that all conveyor openings such as wall and floor openings, and chutes and hoppers, have guards when the conveyor is not in use. § Ensure that start buttons have guards to prevent accidental operation. § Ensure that conveyor controls or power sources can accept a lockout/tagout device to allow safe maintenance practices. § Ensure that all accesses and aisles that cross over or under or are adjacent to the conveyor have adequate clearance and hand rails or other guards. § Place crossovers in areas where employees are most likely to use them. § Ensure that all underpasses have protected ceilings. § Post appropriate hazard warning signs at all crossovers, aisles, and passageways. § Considering emergency egress when determining placement of crossovers, aisles, and passageways. § Equip conveyors with interlocking devices that shut them down during an electrical or mechanical overload such as product jam or other stoppage. When conveyors are arranged in a series, all should automatically stop whenever one stops. § Equip conveyors with emergency stop controls that require manual resetting before resuming conveyor operation. § Install clearly marked, unobstructed emergency stop buttons or pull cords within easy reach of workers. § Provide continuously accessible conveyor belts with emergency stop cables that extend the entire length of the conveyor belt to allow access to the cable from any point along the belt. § Hazards: Conveyor take-up and discharge ends, where the belt or chain enters or exits the in-going nip point; where the belt wraps around pulleys; where the belt changes direction, such as take-ups; or where multiple conveyors are adjoined. § Controls: Guarding of belt conveyors is not always feasible because guarding devices interfere with normal operation. Options for hazard control include guarding by distance as well as installing hazard warning signs and signals. § Hazards: In-going nip points of turning helical flights for the entire length of the screw conveyor when the housing is opened. § Controls: Screw conveyor housing should completely enclose the moving elements of the conveyor except for the loading and discharge points. If such guarding is not feasible, the entire conveyor should be guarded by railing unless it is guarded by location — the hazardous areas cannot be easily accessed by employees. Permanently affixed grids or Plexiglass™ can be installed to allow the operator to inspect the operation. Open troughs can be used if such covers are not feasible; but they should be guarded by location. Alternatively, the trough side walls should be high enough to prevent employees from reaching over falling into the trough. § Hazards: Moving chains since the chains can not be enclosed without impairing the function of the conveyor. § Controls: Guarding of chain conveyors is not always feasible because guarding devices interfere with normal operation. Options for hazard control include guarding by distance and installing hazard warning signs and signals. § Hazards: In-going nip points between the drive chain and sprockets; nip points between belt and carrier rollers; and nip points at terminals, drives, take-ups, idlers, and snub rollers. § Controls: Roller conveyors should have permanent guards that can be adjusted as necessary to protect the worker. For example, when transporting small items on a roller conveyor that does not require the use of the entire roller width, the unused section of rollers closest to the workers should be guarded. § Develop and implement safe operating procedures for conveyors and conduct periodic inspections to ensure compliance. § Allow only trained individuals to operate conveyors and only trained, authorized staff maintenance. § Train employees working with or near conveyors regarding the location and use of emergency stopping devices and the proper procedures for conveyor operation. § Forbid employees to ride on conveyors. § Instruct employees to cross over or under conveyors only at properly designed and safeguarded passageways. § Instruct employees to lubricate, align, and maintain conveyors when the conveyor is stopped. If this is impractical, advise workers to perform this work at a safe distance from any ingoing nip points or pinch points. Installing extended oiler tubes and adjusting screws will help in these instances. § Prohibit employees working with or near conveyors from wearing loose clothing or jewelry, and require them to secure long hair with nets or caps. § Perform servicing and maintenance under an energy control program in accordance with §1910.147. Nice post !! Thanks for sharing with us. If anyone required industrial gears then come to Ashoka Group, the India's leading gears manufacturers and gears suppliers. Here you will get all type of quality gears at competitive rates. We serves industrial gears to almost every industries. Informative blog indeed! It’s obligatory to follow the departmental standards and safety norms while operating heavy machinery, equipments like bearing, conveyor rollers , machinery tools etc. Employees must be educated about the unsafety acts, unsafe conditions, and accidents.